Bern Kohler received his B.S. 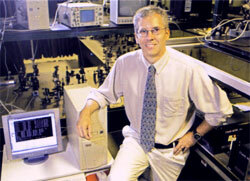 in Chemistry from Stanford University in 1985 and his Ph.D. in physical chemistry from MIT in 1990, where he studied chemical dynamics using femtosecond lasers with Keith A. Nelson. Dr. Kohler performed postdoctoral research first with Urs P. Wild at the ETH Zürich and then with the late Kent R. Wilson at the University of California, San Diego. Bern Kohler was Assistant through Full Professor in the Department of Chemistry at The Ohio State University from 1995 through 2009 when he moved his research group to Montana State University. At Montana State, he served as Interim Department Head from 2011 – 2012, and received the Wiley Faculty Award for Meritorious Research and the Cox Award for Creative Scholarship and Teaching. In summer 2016, Professor Kohler returned to OSU as Professor of Chemistry and Ohio Eminent Scholar. He is a Fellow of the American Association for the Advancement of Science. The Kohler research group uses femtosecond spectroscopy to study excited electronic states in DNA and in nanomaterials of interest for solar energy conversion and photocatalysis. The Kohler Research Group investigates the photophysical and photochemical dynamics of excited electronic states in solution and in solid nanomaterials. Molecular excited states are prepared ‘instantly’ with femtosecond laser pulses and interrogated as a function of time using electronic and vibrational spectroscopy. In analogy to microscopy, which provides access to miniscule spatial dimensions, femtosecond laser spectroscopy reveals the temporal evolution of the microscopic world. Current research projects seek to understand how DNA is damaged by UV radiation, and to develop photochemical approaches for harnessing energy from sunlight. The combination of a tailorable multichromophoric molecule that is highly amenable to study by time-resolved spectroscopy and high-level quantum chemistry has put the field of DNA photophysics at the crossroads of frontier topics in chemical dynamics such as photoinduced PCET, nonadiabatic surface dynamics, and charge and exciton migration. In addition to revealing DNA photoprocesses in exquisite microscopic detail, this research is increasingly relevant to solar energy conversion. The charge transfer states seen in DNA oligonucleotides resemble ones in solar cells constructed of organic polymers. Understanding the fate of excited states in nucleic acids could lead to new strategies for directing energy or charge in multichromophoric systems made from organic building blocks, while minimizing undesired photochemical pathways that compromise photostability. A major new thrust is focused on investigating charge carrier dynamics and other elementary photochemical events in metal oxide nanoparticles made from earth abundant metals such as iron and cerium. A related effort seeks to understand how light-activated catalysts can produce fuels from water and carbon dioxide. Photocatalysis using semiconducting nanoparticles is of interest for water splitting and for the destruction of organic pollutants in aqueous waste streams. The National Science Foundation, NASA, the Department of Energy, and NIH have funded our efforts. There are many new openings as the Kohler Group prepares to move into state-of-the-art new laboratory space in early 2017. Interested individuals should contact Dr. Kohler. Beckstead, A. A.; Zhang, Y.; de Vries, M. S.; Kohler, B. “Life in the Light: Nucleic Acid Photoproperties as a Legacy of Chemical Evolution,” Phys. Chem. Chem. Phys. 2016, in press (DOI: 10.1039/C6CP04230A). Martinez-Fernandez, L.; Zhang, Y.; de La Harpe, K.; Beckstead, A. A.; Kohler, B.; Improta, R. “Photoinduced long-lived charge transfer states in AT-DNA strands,” Phys. Chem. Chem. Phys. 2016, in press (DOI: 10.1039/C6CP04550B). Zhang, Y.; Li, X.-B. ; Fleming, A. M.; Dood, J.; Beckstead, A. A.; Orendt, A. M; Burrows, C. J.; Kohler,B. “UV-Induced Proton-Coupled Electron Transfer in Cyclic DNA Miniduplexes,” J. Am. Chem. Soc., 2016, 138, 7395–7401. Zhang, Y; de La Harpe, K.; Beckstead, A. A.; Martínez-Fernández, Improta, R.; Kohler, B. “Excited- State Dynamics of DNA Duplexes with Different H-Bonding Motifs,” J. Phys. Chem Lett., 2016, 7, 950-954. Zhang, Y.; de La Harpe, K.; Beckstead, A. A.; Improta, R.; Kohler, B. “UV-induced Proton Transfer Between DNA Strands,” J. Am. Chem. Soc. 2015, 137, 7059-7062. Stark, C. W.; Schreier, W. J.; Lucon, J.; Edwards, E.; Douglas, T.; Kohler, B. Interligand Electron Transfer in Heteroleptic Ruthenium(II) Complexes Occurs on Multiple Time Scales, J. Phys. Chem. A 2015, 119, 4813-4824. Zhang, Y.; Dood, J.; Beckstead A. A.; Li, X.-B., Nguyen, K. V.; Burrows, C. J.; Improta, R.; Kohler, B. “Photoinduced Electron Transfer in DNA: Charge Shift Dynamics Between 8-Oxo-Guanine Anion and Adenine,” J. Phys. Chem. B 2015, 119, 7491-7502. Chen, J.; Zhang, Y.; Kohler, B. “Excited States in DNA Strands Investigated by Ultrafast Laser Spectroscopy,” Top. Curr. Chem. 2015, 356, 39 – 88. Henrich, J. D.; Suchyta, S., Kohler, B. “Ultrafast Hydrolysis of a Lewis Photoacid,” J. Phys. Chem. B 2015, 119, 2737-2748. Lu, Z.; Beckstead, A. A.; Kohler, B.; Matsika, S. “Excited State Relaxation of Neutral and Basic 8-Oxoguanine,” J. Phys. Chem. B 2015, 119, 8293-8301. Zhang, Y.; Dood, J.; Beckstead, A.; Li, X.-B. ; Nguyen, K. V.; Burrows, C. J.; Improta, R. “Efficient UV-induced charge separation and recombination in an 8-oxoguanine-containing dinucleotide,” Proc. Natl. Acad. Sci. USA, 2014, 111, 11612-11617. Chen, J.; Kohler, B. “Base Stacking in Adenosine Dimers Revealed by Femtosecond Transient Absorption Spectroscopy,” J. Am. Chem. Soc., 2014, 136, 6362-6372. Zhang, Y.; Chen, J.; Kohler, B. “Hydrogen Bond Donors Accelerate Vibrational Cooling of Hot Purine Derivatives in Heavy Water,” J. Phys. Chem. A, 2013, 117, 6771-6780. Schreier, W. J.; Schrader, T. E.; Koller, F. O.; Gilch, P.; Crespo-Hernández, C. E.; Swaminathan, V. N.; Carell, T.; Zinth, W.; Kohler, B. “Thymine Dimerization in DNA is an Ultrafast Photoreaction,” Science 2007, 315, 625-629. Crespo-Hernández, C. E.; Cohen, B.; Kohler, B. “Base stacking controls excited-state dynamics in A·T DNA,” Nature 2005, 436, 1141-1144.